Nylon Bias Ply Constructed Tire for Durability and Bruise Resistance. 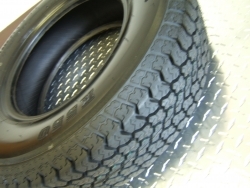 The LoadStar Trailer tire provides a 2 year warranty with the warranty Phone number imprinted on each tire. These tires provide: Longer Wear, Better Towing Stability, Reduced Rolling Resistance and meets all US Dept of Transportation requirements. Down To Earth Factory OEM Tire. ©2009 Down To Earth Trailers, All Rights Reserved. Site Design and Hosting by Visual Edge Design, Inc.